Thirty-eight people became new Americans at the Littleton Center July 25. Native Englishman Jack Durston welcomed fresh Prince George Alexander Louis to the world on July 22, then promptly renounced his allegiance to him three days later. 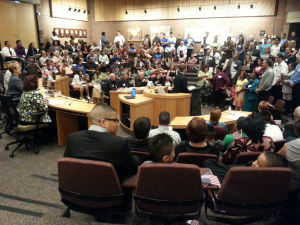 “I hereby declare, on oath, that I absolutely and entirely renounce and abjure all allegiance and fidelity to any foreign prince, potentate, state or sovereignty, of whom or which I have heretofore been a subject or citizen,” he said along with 37 other newly minted Americans July 25 during their naturalization ceremony at the Littleton Center. Durston came to America in 1985, sponsored by his stepmother. Times had been rough in his touristy, seaside hometown of Folkestone, and jobs were scarce. “I was so young, and there was so much turmoil,” he said. He became a drive-train mechanic in California, where he met his wife, Holly. She and her native land of Littleton convinced Durston he was here to stay. The city has gained national attention for the Littleton Immigrant Resource Center, housed at Bemis Library and supported by the Littleton Immigration Integration Initiative. U.S. Sen. Michael Bennet has touted its work with the “Gang of Eight” on immigration policy, and in April it won a $145,000 grant from the United States Citizenship and Immigration Services — which just lured away Alejandra Harguth, LIRC’s longtime director. “Weve taken really a national lead in welcoming people from around the world to our community,” said Susan Thornton, an LI3 founder. Mayor Pro Tem Bruce Stahlman noted that everyone in the room, not just the honorees, originated from elsewhere. “They’ve all added their distinct cultures to the montage that is the United States,” he said. The 38 honored that night represented 21 different countries. There were 18 from Mexico, two from Cameroon and one each from countries as diverse as the Netherlands, Poland, Bosnia and Ethiopia. Mayor Debbie Brinkman encouraged them all to actively engage in their new country. “As you embrace your rights and responsibilities of being American, I hope you will take advantage of all our country both offers and expects,” she said. To that end, representatives from Mi Familia Vota were on hand to register the new citizens to vote before they even left the building, and business was brisk. Romaine Pacheo, the director of Gov. John Hickenlooper’s office of boards and commissions, counted voting as a top benefit of citizenship, along with wider job opportunities, the chance to sit on a jury and freedom of expression. “It’s the best place to raise kids and the best place to lead safe and comfortable lives,” she said. Even President Obama paid a visit to the council chambers, albeit via prerecorded video. “Always remember that in America, no dream is impossible,” he said.